The MAN RR4-26.480 chassis features the 12.4-litre engine D2676 Euro6 unit which delivers torque of 2,300Nm. Is this what they mean by the Northern Powerhouse? 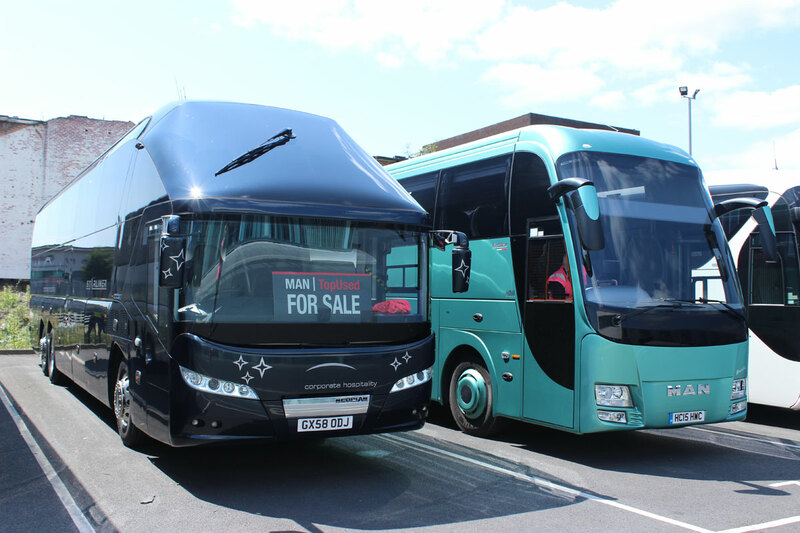 Having been associated with the Marcopolo, Beulas and Tata-Hispano brands until relatively recently, BASE Coach Sales, the dealership subsidiary of Holmeswood Coaches, has in the last 12 months effectively started again with the range of products it offers to operators. With the demise of Tata-Hispano at the end of 2013 and Beulas’s decision last year to transfer the franchise to the associated Moseley group of companies, the business started looking for new partners with which to work. The decision to become the distributorship for MobiPeople was perhaps an obvious one, as its MD, Antonio Catarino, was a man they knew well from his many years at Marcopolo. BASE’s second new partner was perhaps more of a surprise. 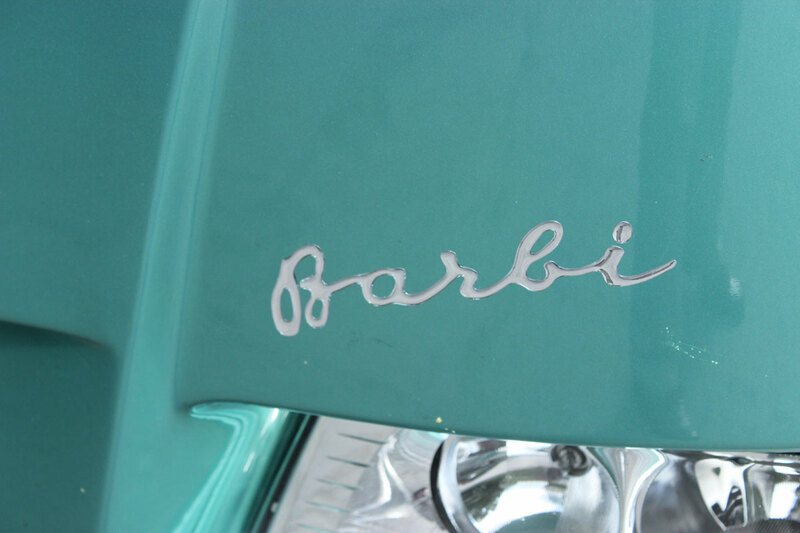 The Italian Carrozzeria Barbi concern has been in business since 1905 when Galileo Barbi started building horse drawn carriages, later moving on to cars and commercial vehicles and eventually, in the early 1930s, to coaches. It has always been a family run company and remains so today, as anyone who met Isabella Barbi at the NEC last year, when BASE first displayed its new partners’ coachwork, will be aware. Heading the company are brothers Carlo and Alberto Barbi who introduced a new model called the Genesis in 2000 and marking the company’s centenary followed that with the Galileo range, named after the founder, which is what BASE will be importing. If you’d like to know more about the company the www.barbi.it website is well worth a look (and it’s in English if you click the flag). 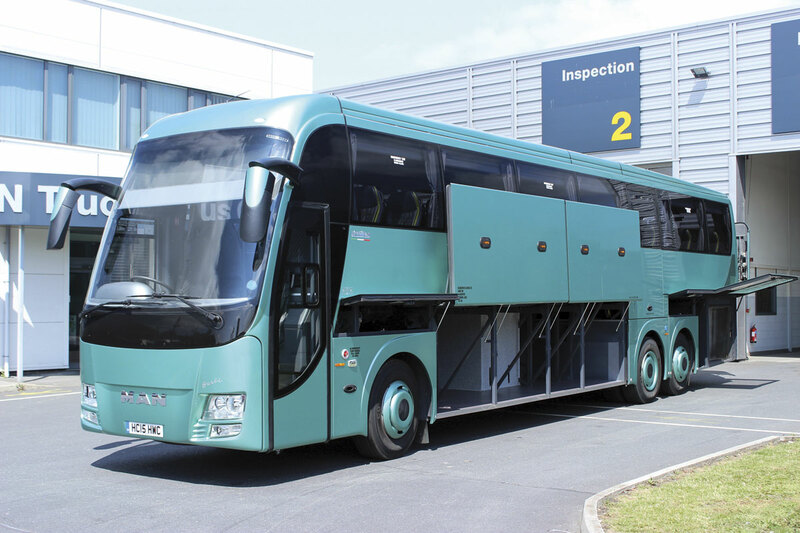 Barbi has not offered its products in the UK before, though readers may remember our coverage of its competing in the 2009 Coach Euro Test event at Senlis near Paris, when a Galileo HD on a Volvo B7R chassis was entered. One of the coaches it was competing against was a Plaxton Elite bodied Volvo B11R 6×2. In the intervening period Barbi has ended its longstanding relationship with the Volvo brand and is now building a new one with MAN. It has also been hampered by an earthquake that damaged its plant at Mirandola near Modena. BASE had originally considered it with a view to replacing the gap left in its range by Tata-Hispano closing, but with Beulas moving it has left a far wider scope for Barbi to build for the UK market. Three different options were originally envisaged but already the offering has grown to four with a 10.8m model added to the 10.35m, 12.4m and 13.8m tri-axle coaches first planned. 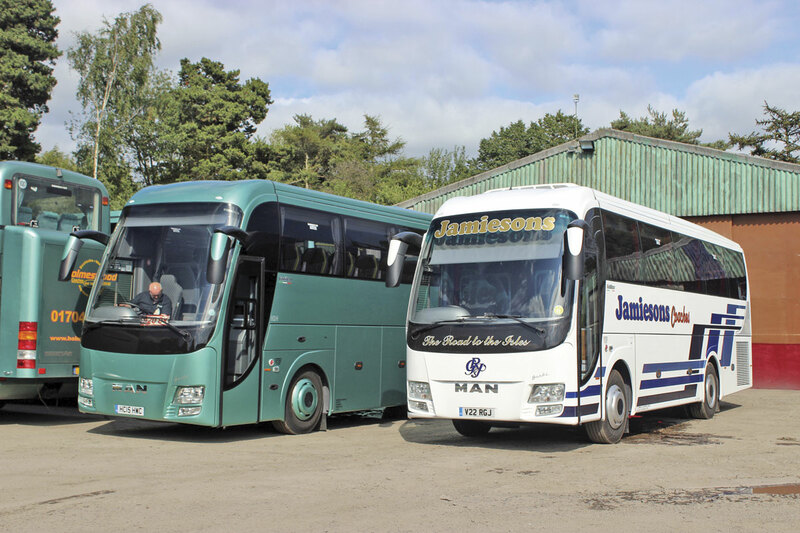 The first two coaches, a 13.8m Galileo HDH bodied MAN RR4 for the Holmeswood fleet and a 10.35m Galileo HD bodied MAN RR2 for Jamiesons Coaches of Shetland, arrived in the country earlier this month and Stuart Jones went to Holmeswood’s depots in Leyland and Rufford to have a look at them. Mounted on the MAN RR4-26.480 tri-axle chassis with 480hp engine and steering rear axle, the Galileo HDH is the flagship of the Barbi range and designed to take a similar position in operators’ fleets. 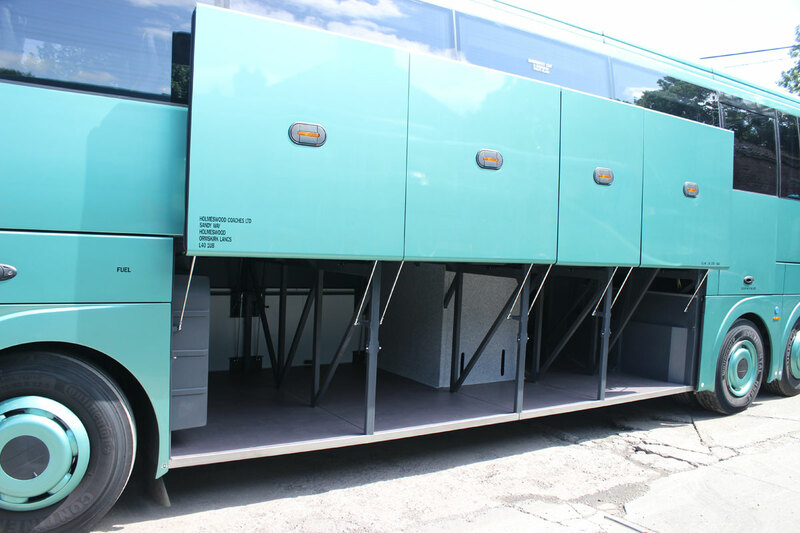 A super high floor coach that is 3,820mm over the air conditioning pod, it is initially only being offered to one overall length and that is 13,800mm, which enables a maximum of 61 seats to be installed with the toilet, or 63 without. All models are similar in external appearance with a large one-piece sloping screen leading into a prominent front dome that curves into a roof line accentuated by full length fairings that largely hide the air conditioning system mounted a little to the rear of the roof centre. Rather than multi section front and rear lower panels, single piece mouldings incorporating the light units cantilever up giving excellent access to the spare wheel at the front and the engine and ancillaries at the rear. The side window line is straight and the side glass is the same depth on all models, as are the stretched side panels. 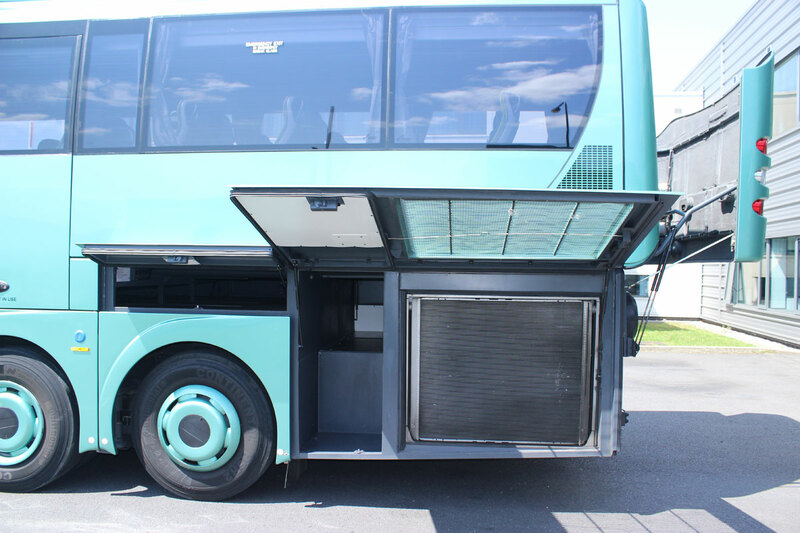 The difference in height between the HD and HDH is accounted for by the section between the top of the wheelarches (not the wheelarch panels) and the bottom of the main side panels, within which the over wheelarch lockers are located. Distinctive external styling features across all models include curved sweeps moulded into the wheelarch panels and black painted sections beneath the front screen and running in a curve from low on the passenger door into the top of the B-pillar. At the rear of both sides there are curved grilles and at the back there is a shaped window with three curved intakes below. 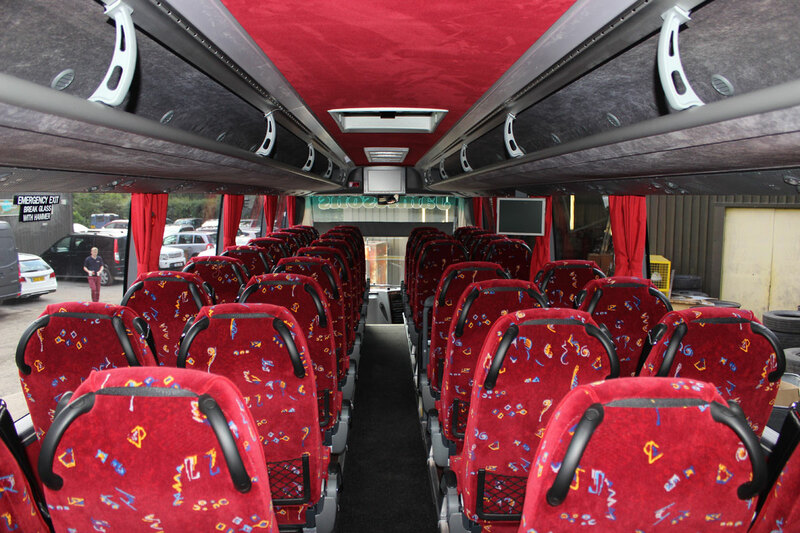 Overall the visual effect of this is a coach that has presence and its own look but is classical rather than adventurously styled. It has a vast luggage capacity certified at 16 cubic metres but actually in excess of 20 cubic metres. 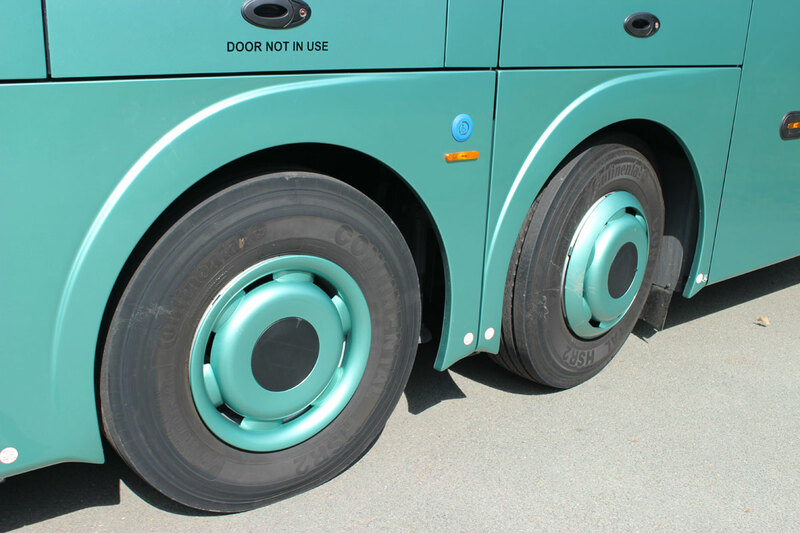 This apparent anomaly arises because it is certified in the UK to IVA regulations under which the luggage capacity is based on a calculation of the capacity of each axle rather than the total GVW. Thus the allowance, based on 100kg per cubic metre, is 1,600kg or 1.6 tonnes. Were it European Type approved (as it is in left hand drive form) the higher figure would apply. All of this is fairly academic, because there are acres of space in the hold within the main 6,700mm wheelbase, as well as in additional lockers over the front and rear axles. 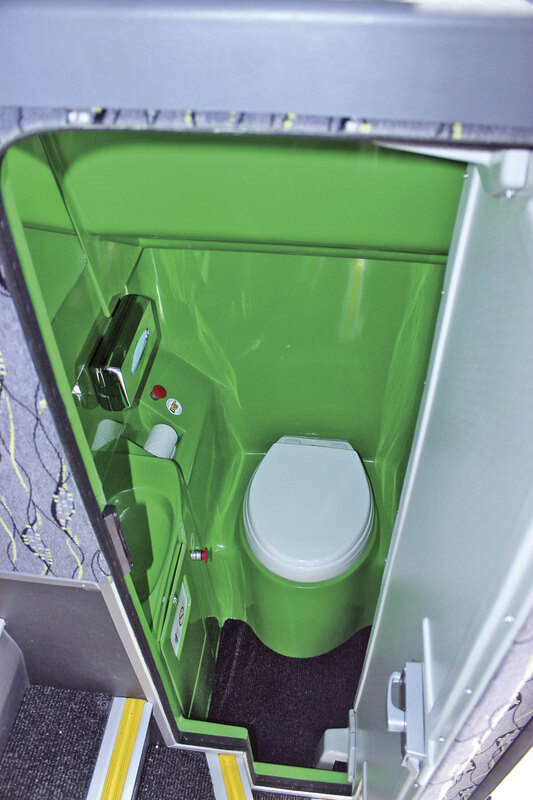 Access to the main hold is through no less than four cantilevered locker doors on the nearside, with a further two on the offside ahead of the toilet compartment and continental door. 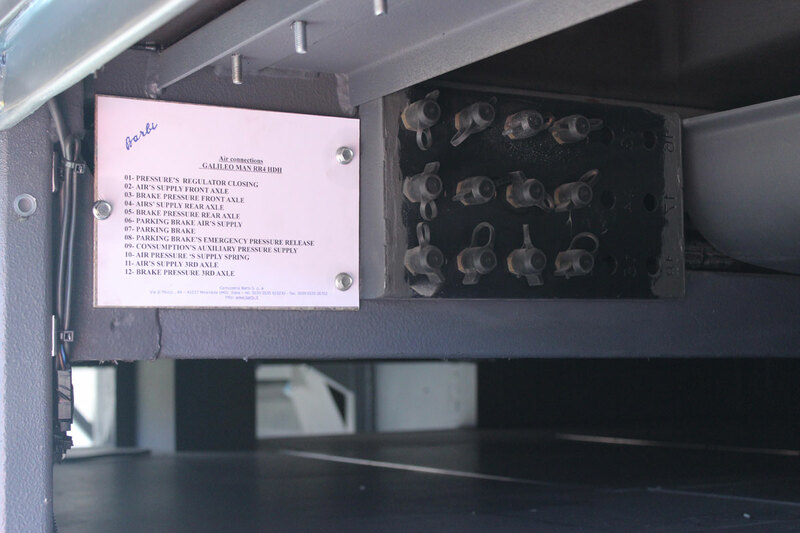 The main electrical centre is in a panel protected by a plastic cover on the nearside of the front hold bulkhead and there is a separate box for the engine systems. 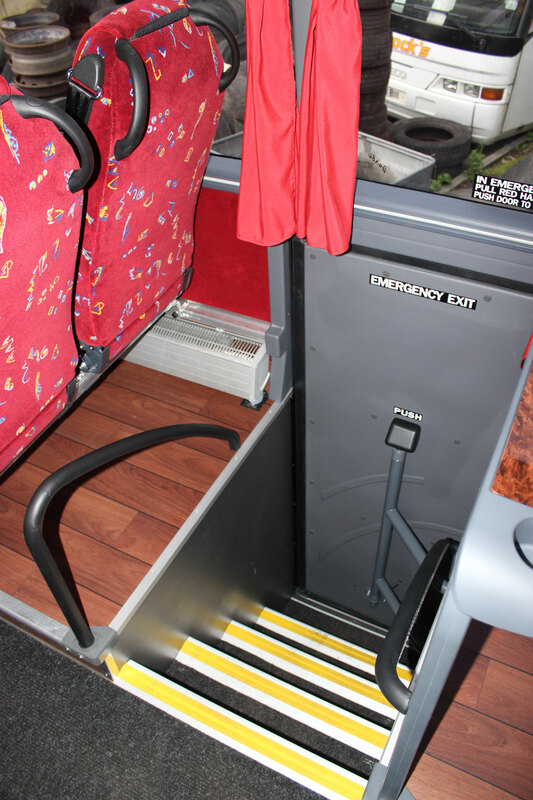 As a company that has always taken the provision of coach services to people in wheelchairs very seriously, Holmeswood will be equipping their new acquisition with a PLS cassette lift in the locker over the drive axle on the nearside once the summer rush quietens sufficiently to enable them to do so. A combination of CAD-CAM design and the fact that they have been supplied with a blank unit to work with ensures that it will fit straight in. The door necessary was fitted by Barbi during the build process, though it is to have the hinges moved from the interior to the exterior to make the loading and unloading operation easier. 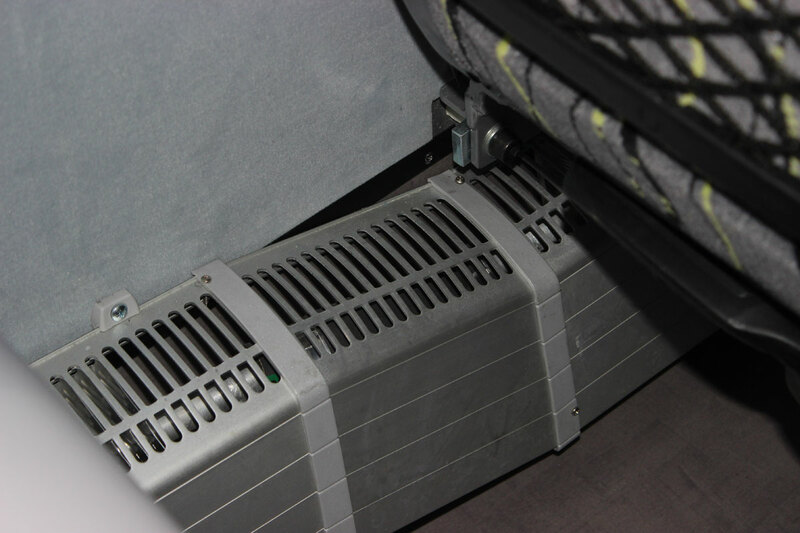 Tracking has been installed beneath four double seats in this area but this is to be replaced with Koller Apollo Mk2 wheelchair and occupant restraint systems providing space for two wheelchairs. 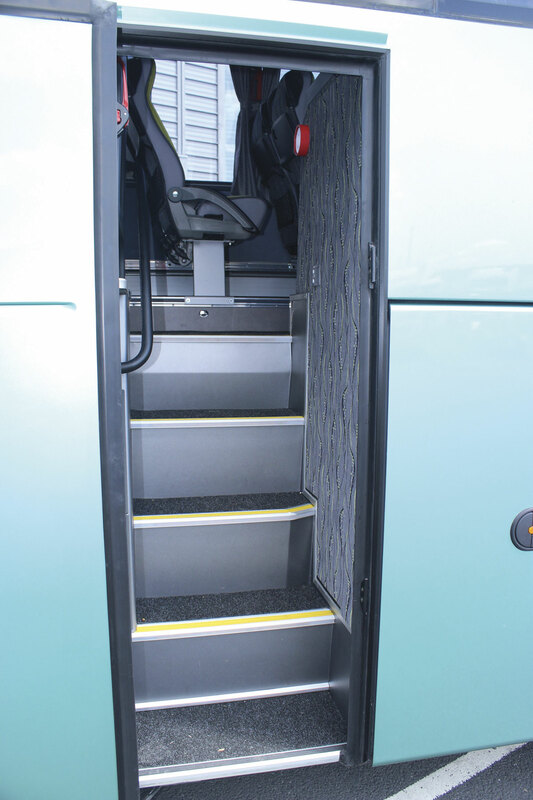 At the main entrance there are four steps from the ground to quite a small platform area, the first of 330mm and those on the coach each of 190mm. To the left is a useful rail trimmed in black leather and on the immediate right a vertical pole. Thereafter there are three more steps to the sunken aisle. 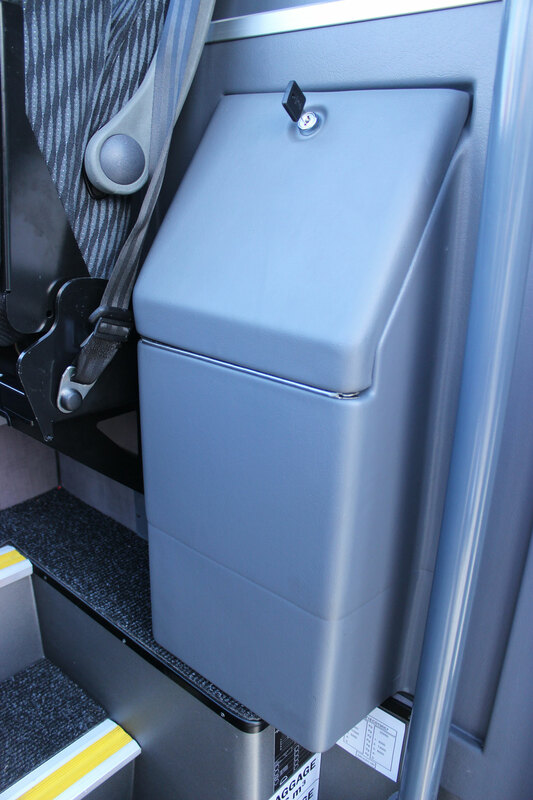 Alongside these steps on the face of the front offside seat riser is a moulded open DVD/CD storage case. 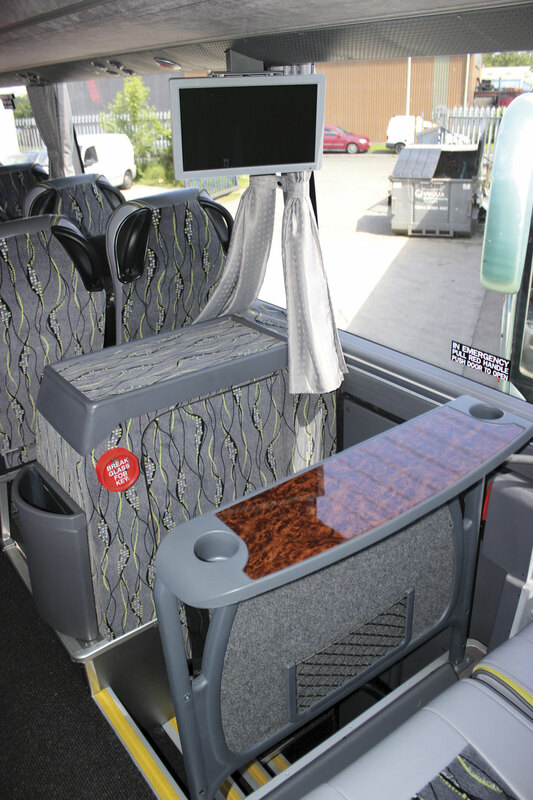 A fridge is provided to the left of the courier seat on this coach and it will have a Frenzel unit supplied by AD Coach Systems or a Shades servery fitted on top of the toilet unit in the UK. Future examples will have this done at the factory. The dash is finished in grey as standard. An undercut beneath the dash provides additional room for the courier’s toes, an arrangement that I found very comfortable. 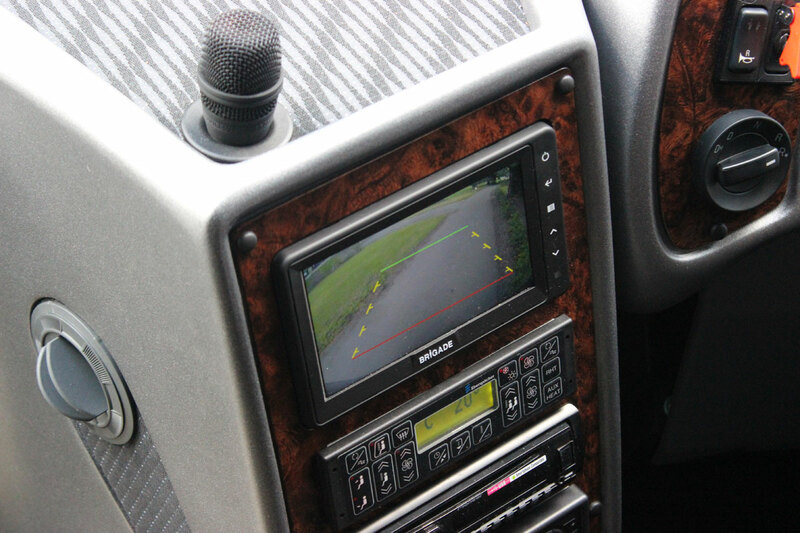 A Brigade rear view camera system and display screen is fitted and worked well and the radio/PA/amplifier system can either be Bosch or the Italian B&B system, which Holmeswood are trialling and quite like. A manual sliding peage window is inset within the glazing of the plug entrance door. The carpeted sunken aisle is flat for its length until there is a full saloon width step up beneath the penultimate seat row, resulting in the final row, all of which recline, being set slightly higher than the other seats. 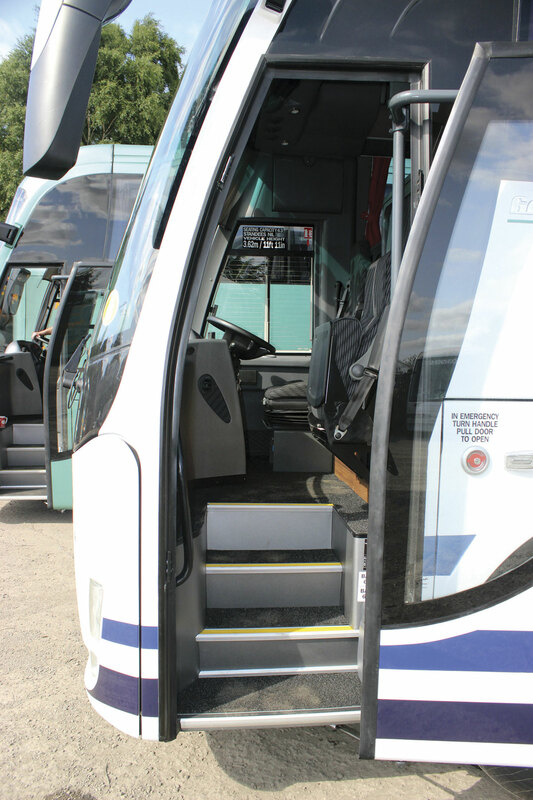 Mounted on the offside with six rows of seats ahead of it and eight rows beyond, the centre continental entrance has five steps from the ground, each of 298mm after a 330mm step up to the coach. The toilet compartment is to the right as you ascend. On previous vehicles for the Holmeswood fleet the Aspinall family have usually opted for fairly restrained specifications but on this one they’ve gone wild and specified the seats with bright green side flaps that really lift an interior predominantly trimmed, and the floor covered, in various grey shades (and you thought I was going to say 50 Shades of Grey). 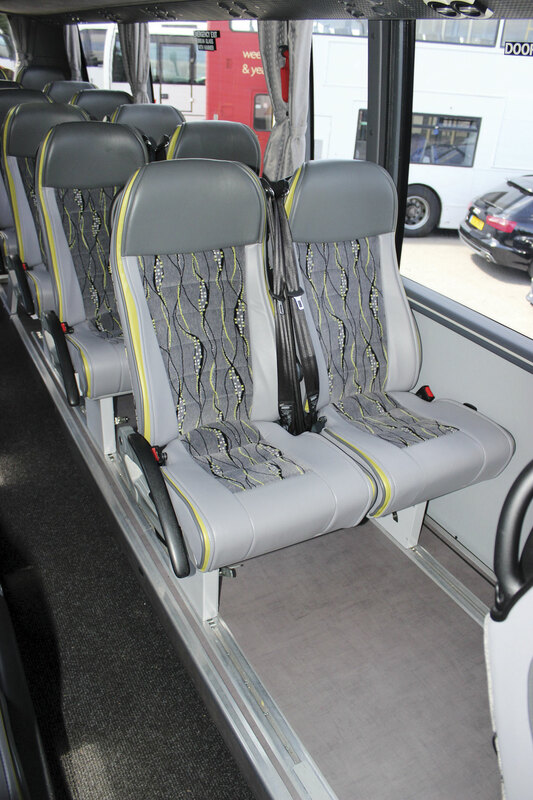 The seats themselves are Kiel units Avance R recliners equipped with adjustable footrests, magazine nets, tables with drink insets, grab handles, aisle armrests and lap belts in addition to the leather trimmed headrests, piping and side panel sections. Side-slide is not standard but is an option. Air conditioning currently uses a Sütrak system but the intention is to switch to Konvekta for greater commonality with other MAN product. Looking closely at the HDH there were a few minor areas in which I felt improvements could be made, but these do not mean that I was not very taken with what I saw. At the entrance, I would have liked to see a more neatly finished edge to the carpeting on the floor section in front of the dash to ensure boarding passengers are never presented with the sight of a frayed carpet edge. I’d have liked to see more made of the leather trimmed handrails at both entrances, perhaps with the use of contrasting stitching, as I did not initially realise that they were leather. I’d like to see a larger centre monitor (or a third monitor) to give those sat at the back a better view of the screen, and I’d also have liked to see less visible screws securing the front dash in place. I have a slight issue with the way that the passenger service units on the outer edge of the rack undersides are longitudinally tilted towards the centre of the coach. 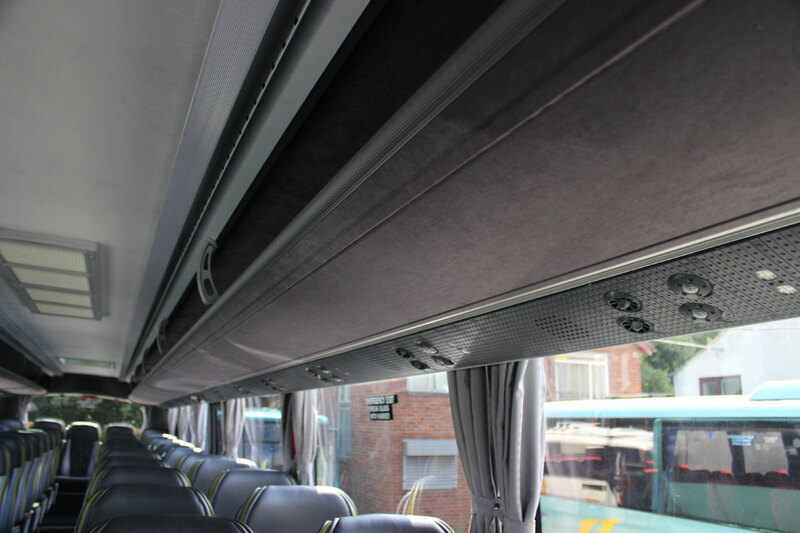 While this may help to direct the fresh air towards the passengers, it reduces the depth of the view the aisle passenger has through the side window and reduces light reaching the interior. I also found the rear vents very close to my head. The RR4 chassis utilises the D2676 12.419-litre, six-cylinder Euro6 engine which develops 480hp/353kW at 1,800rpm and peak torque of 2,300Nm at 930-1,400rpm. 440hp, 400hp and 360hp outputs are also available. It utilises both EGR and SCR with MAN estimating AdBlue usage of between 3-5%, requiring replenishing of the 60-litre AdBlue tank every other time the diesel tank is filled. 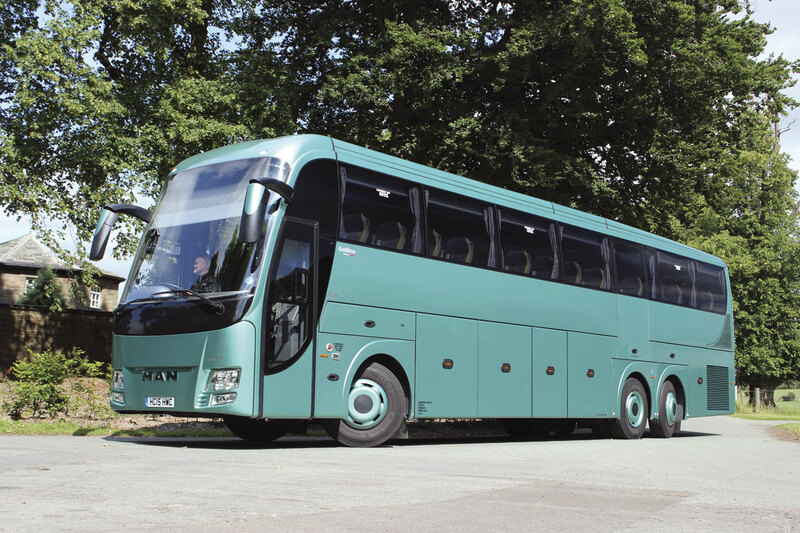 A 480-litre diesel tank is standard with an additional 200-litre capacity an option. It is matched to the MAN TipMatic 12-speed automated manual transmission which is the ZF AS-Tronic under another name complete with ZF intarder. 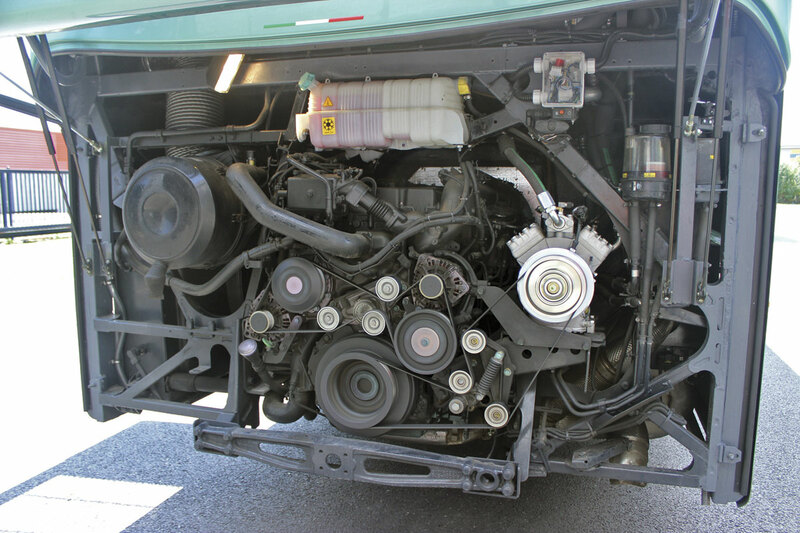 The same manufacturer supplies the Servocom power steering system. The front axle is an independent unit, the drive (centre) axle has a 3.15:1 ratio and the third axle is electro-hydraulically steered. Wheels are steel 22.5 x 9.00 10 stud discs shod with 315/80R22.5 tyres. To demonstrate how the RR4 Galileo HDH performed, Mark drove it from Leyland to MAN’s Trafford Park coach facility. He was already well accustomed to driving it having been with his father, Francis, to collect it from the plant, travelling back via the Brenner Pass and Lille. It had also already seen active service, my original appointment to see it having been put back a week when a similar capacity vehicle had encountered a problem and the HDH had deputised on a 12-day tour of England and Wales with an American choir. In terms of ride quality and passenger comfort, the tri-axle really delivers. It was quiet at the rear and throughout the saloon, indeed the only untoward noise at all was from the forward pane of the sliding driver’s signalling window, which had the terminals of the heating elements exposed creating wind noise. Opening the window very slightly cured it completely though. BASE will be finding a non draft creating alternative solution. Knee room was good, there were no body rattles, and shimmer from the windows was noticeably absent. A slightly odd and easily rectified quirk was that the exhaust valve for the air from the driver’s air suspended seat was audibly exhausting within the cab rather than outside. That was Mark’s excuse anyway. Mark was very pleased with the way it drove. From a standing start unladen it selected third, changing to fifth at 1,400rpm, seventh at 1,550rpm, eighth at 1,100rpm, then ninth at 1,100rpm at 30mph. Although driving steadily it did not generally go into 12th until it reached around 60mph/95kph at 1,175rpm, it would happily hold 12th and pull away at 50mph/80kph. Climbing on the M6 it was recording 1,200rpm in top (12th) at 100kph. The baby of the Barbi range, the 10.35m Galileo HD is 3.68m high and looks very solid and well proportioned. 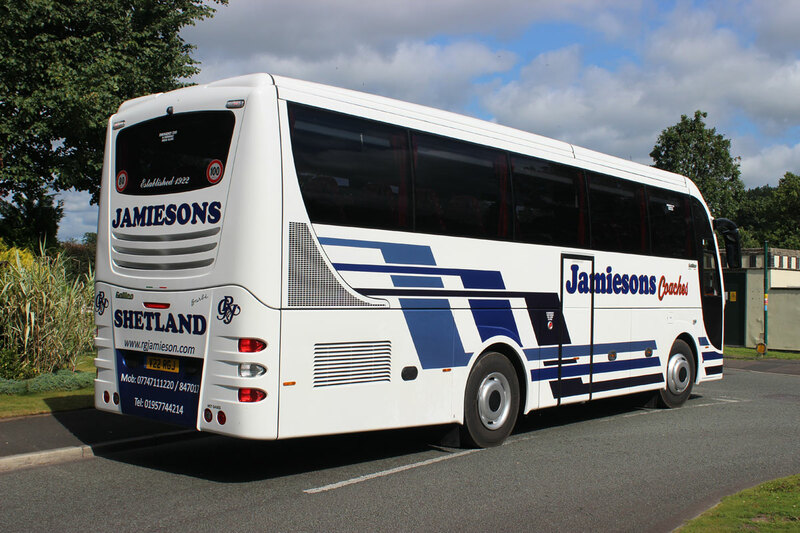 It offers a maximum of 43 seats when no toilet is fitted, and this is the specification opted for by the first customer, Jamiesons of Shetland. With toilet the maximum is 41. It is mounted on the MAN RR2-19.360 chassis which has the 360hp/268kW MAN D2066.LOH31 engine matched to the ZF EcoLife fully automatic transmission. The RR2 chassis is the successor to the R33 Radial chassis and will also be used for the 12.4m Barbi options BASE is offering. Inside the key features, including the rack layout, are the same though the look was very different because of the successful use of red shades, in contrast to the blue and white external livery. 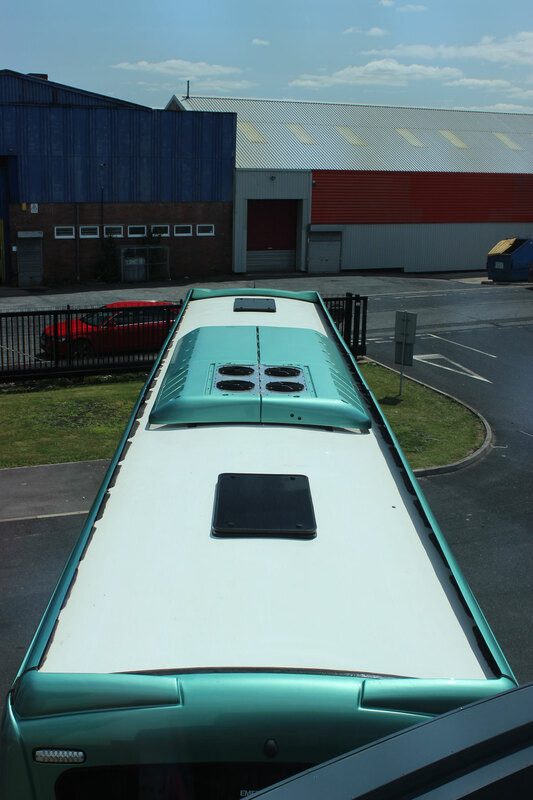 Mark explained that Barbi offers a range of over 200 moquettes for the roof, sides, seats and piping including modern and traditional styles for customers to choose from. It had wood plank effect floor covering which has become so popular in recent years, though the aisle and entrance were carpeted, and a five step continental entrance (from the ground). The luggage hold, which has no toilet compartment to restrict it, delivers 9.5 cubic metres of luggage space though the certification is for 6.45cu.m based on 645kg. We didn’t go very far to take the photographs, but it didn’t take any distance to show that on the road the RR2 with the 360hp unit and ZF EcoLife transmission is a responsive performer, smoothly and seamlessly accelerating with deceptive rapidity without the passenger experiencing any negative forces or even noticing the changes. Showing how flexible Barbi is and how willing it is to provide what customers want, is the addition to the range of a new 10.8m version of the HD using the same RR2 chassis. 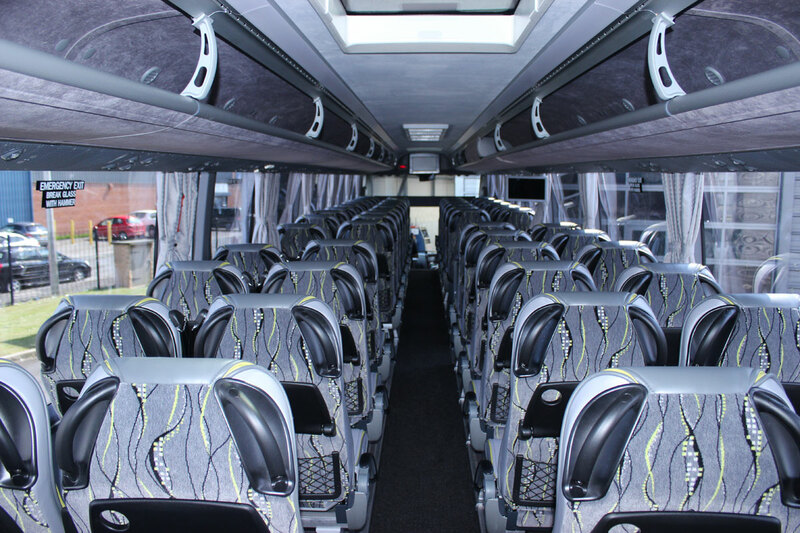 Mark explained that, ‘someone asked us for 47 seats in a coach and in less than two hours we had drawings back from Barbi and a new 10.8m length in the product line up that they had never built before. Obviously there are some homologation costs.’ The first two examples have been sold to Timberbush Travel of Edinburgh. 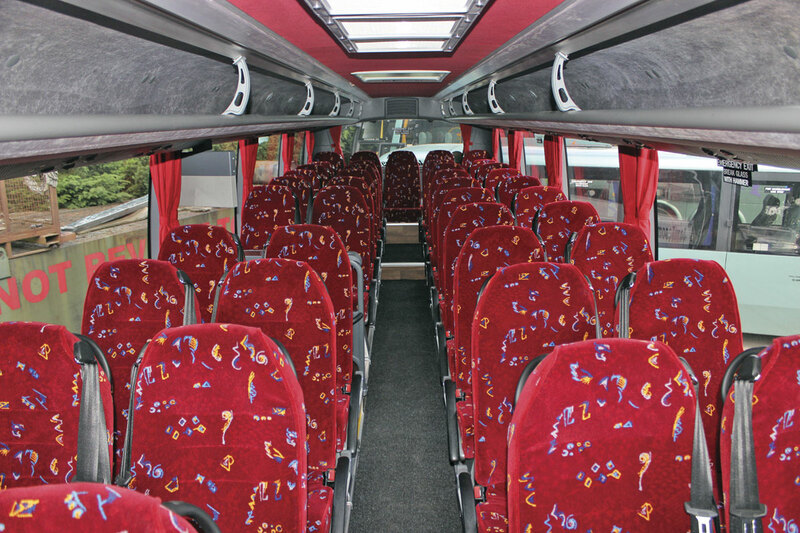 A version with 45 seats and a toilet can also be built. Compared with the retail pricing of some other dealers BASE have never had room for inflated part exchange prices as their trading style is more focused on net priced deals, but even taking this into account the Barbi range does represent quite a competitive package for what you get. The retail figure I was quoted for a 13.8m Galileo HDH to the specification shown without a side lift installed was £290,000. Adding the lift would increase that by approximately £14,000. 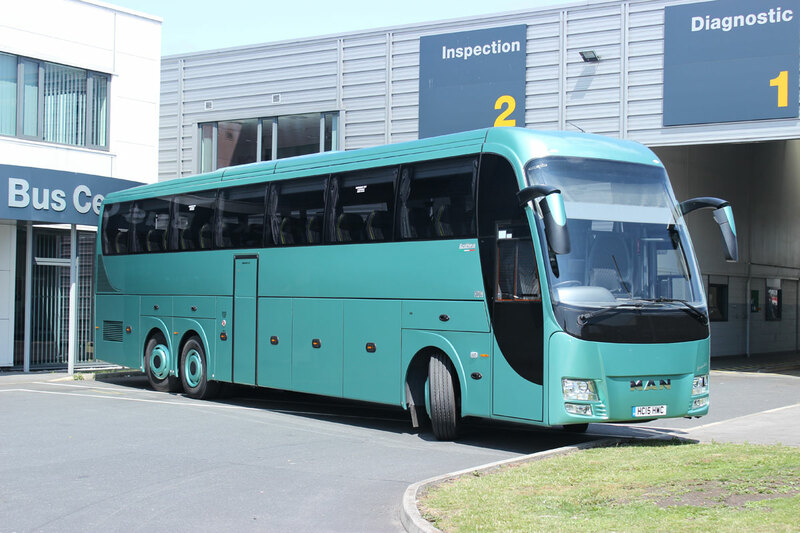 For a 10.35m Galileo to executive specification the retail figure is £215,000 and opting for the 10.8m version would increase that by around £5,000. 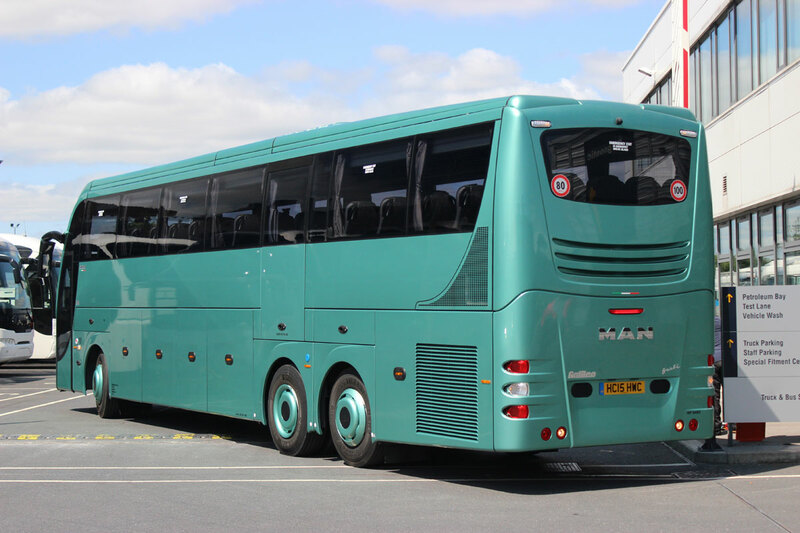 Also available shortly will be a wheelchair accessible 12.4m long Galileo HDL 53 seat executive on the MAN RR2 chassis which will be capable of offering up to six wheelchair spaces and retail at £270,000. Part of the buying decision is not just the purchase price but also the residual value. Some will have concerns about investing in product from a company so relatively small compared with the big guys, a point I put to Mark Aspinall, who said that this was something they had thought hard about before linking up. Barbi production figures have been down because of the combined effects of changing chassis partners and the earthquake aftermath, but both have now been put behind them. He pointed out that BASE had invested between £30,000 and £40,000 in the development of the new product range for right hand drive, and for their part, Barbi had invested several times that figure, which he saw as solid evidence of their commitment. ‘They are coming to the UK for the long term,’ he concluded. 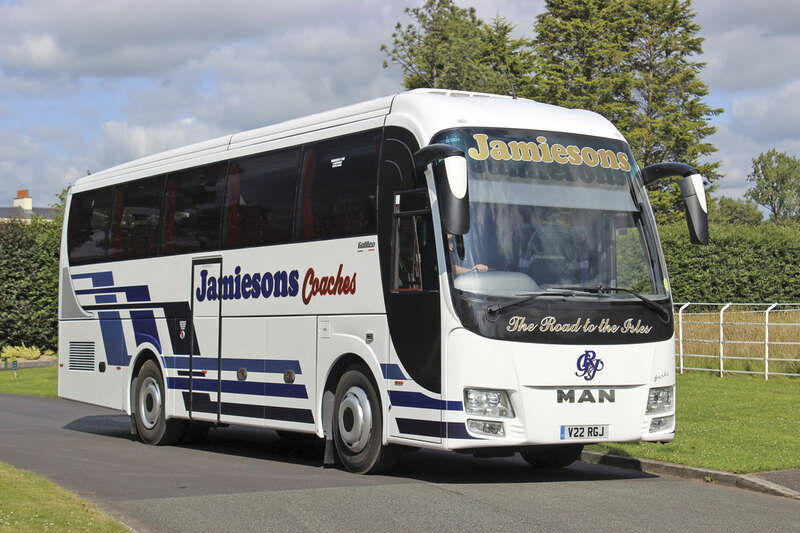 In the past, BASE had pursued a policy of offering a variety of chassis, selling VDL and Iveco mounted products as well as those of MAN, but this has now changed and it is offering everything exclusively on MAN. With BASE Director, Mark Aspinall and General Manager, Nick Dodgson, I met Graham Wilkinson, MAN’s Sales Technical Engineer, at MAN Truck & Bus’s Trafford Park premises. Future developments on the chassis are imminent with the requirement for lane assist and emergency brake assist (EBA) systems mandatory on new build from October. MAN chassis already had the ESP system necessary to make the new systems work and all future chassis will be supplied fitted with them. Graham explained that Lane Guard had a dash mounted camera looking at the white lines ahead. 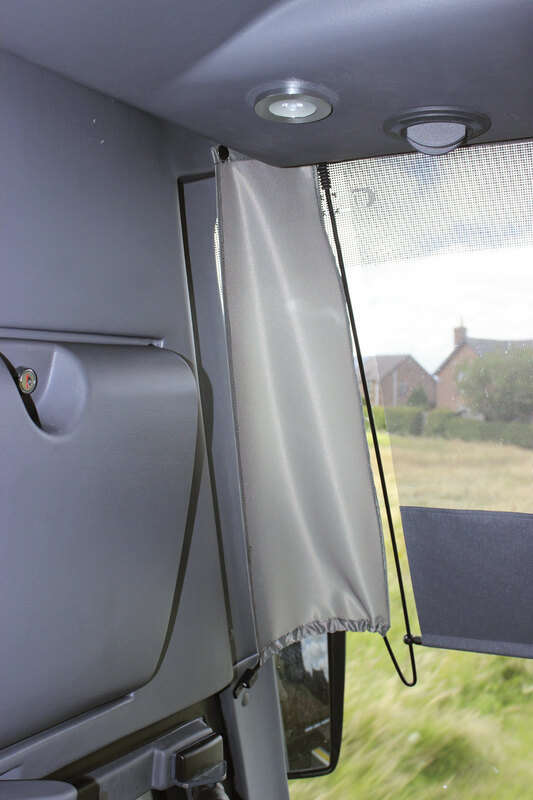 If the coach starts to cross the white line without the indicator being activated the driver will either receive a haptic warning (vibrations through the seat) or a noise through the speaker, though the latter is usually only specified on trucks. The EBA is controlled through a radar device mounted low in the front panel. Liaison between body and chassis manufacturer on where to install it is critical. It is also possible to upgrade the EBA to give an adaptive cruise control facility by installing a revised hardware package as a cost option. 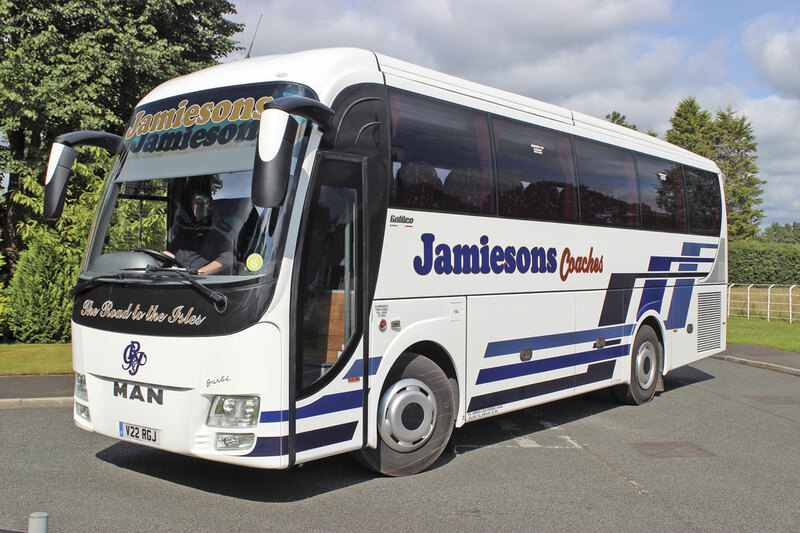 Also new on the Jamiesons coach and standard on all subsequent Barbi coaches will be a multi-function steering wheel with cruise control, dashboard display functions, volume control, fuel consumption gauge and Bluetooth (if fitted). As it has turned out, the changes in what body options it offers appear to be working out very well indeed for BASE, something Mark Aspinall puts down to offering vehicle specifications that meet the needs of operators. It isn’t a year yet since MobiPeople and Barbi were first shown at Coach & Bus Live but already BASE has sold 24 MobiPeople coaches (15) and minicoaches (9) and has just placed chassis orders with MAN that will take to 36 the number it is committed to putting through the Coimbra plant in Portugal. The largest single order among these is one from Festival Travel calling for six 70-seat Explorers before the year end, while a repeat order from KB Travel is confirmation that the vehicles are performing. Things are going so well that MobiPeople is considering expansion to cope with the demand. The programme includes stock vehicles, though these too are going fast. The first stock MidiExplorer was sold after only ten days in the country. 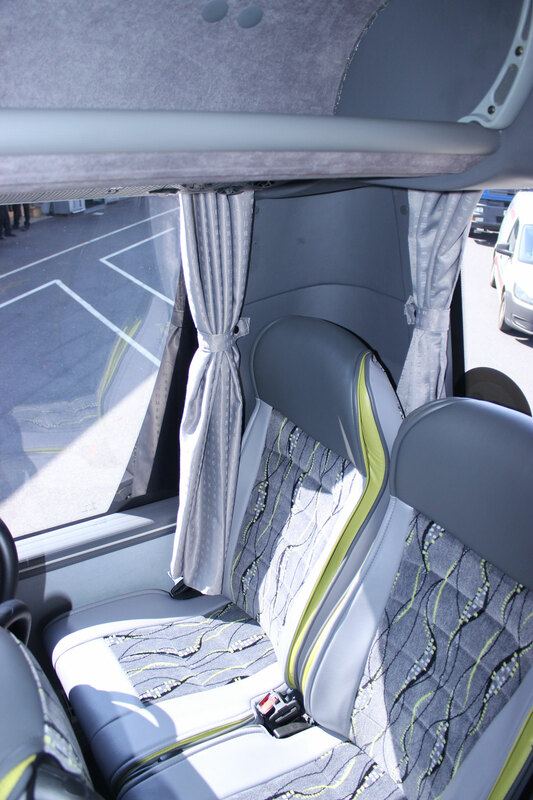 Trimmed in half leather they are proving popular with customers who really need a 33 seater (optionally 34 seater) and like the cost effectiveness of a net price in the low £120,000s including double glazing and air conditioning. With the first Barbi customer order about to enter service with Jamiesons and news of the Timberbush order, it looks as if there is early demand for the Italian product on which the BASE team can build. BASE had originally said that there aim was to sell three Barbi units in the first year, six in the second and nine in the third, but already, within a year, the seventh and eighth chassis for bodying have been ordered. This year’s show will see the first appearance of the 12.4m Galileo HDL. ‘I’m really looking forward to that because there are a lot of customers wanting to see it,’ said Mark. 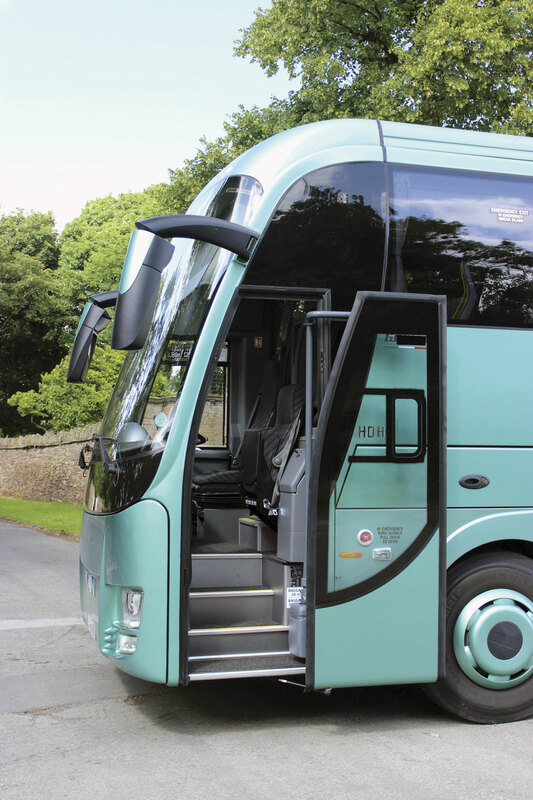 Solidly built and classically stylish, the Barbi provides the market with a number of new alternatives at a time when top of the range options in the large coach sector have been diminishing. 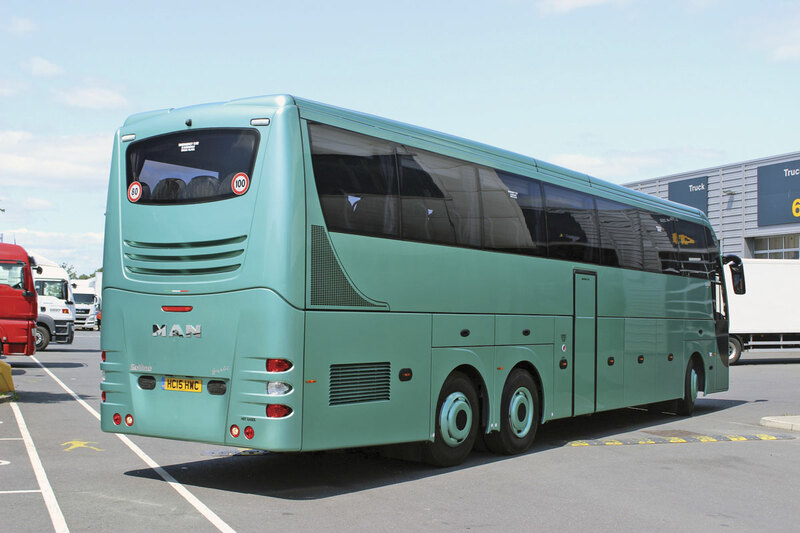 It isn’t outrageous in appearance in the way of the Neoplan Starliner and it isn’t quite as refined inside as a Setra, but it does have a lot of class and it is unlikely that, when you stop at a motorway service area, your passengers will find it indistinguishable from other coaches parked there. 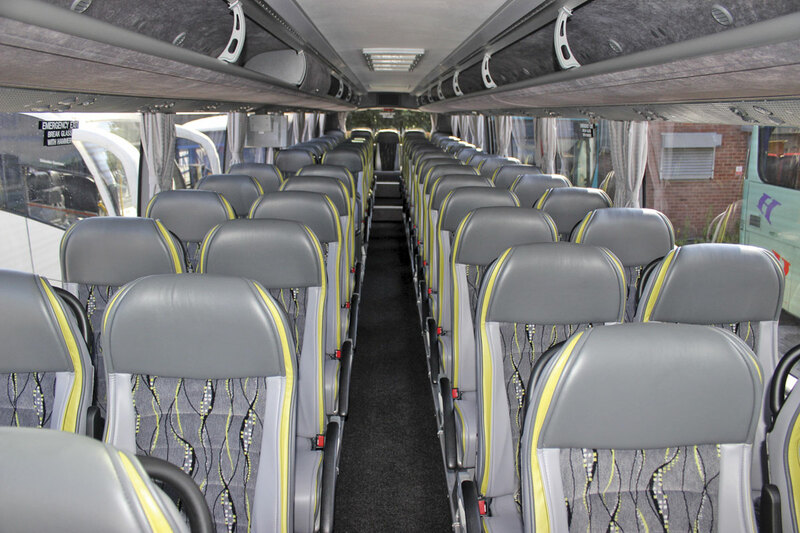 A coach of this nature is a long term investment that will need to work hard to justify its purchase and nothing I saw or experienced during my visit suggested that it was not well up to the task. 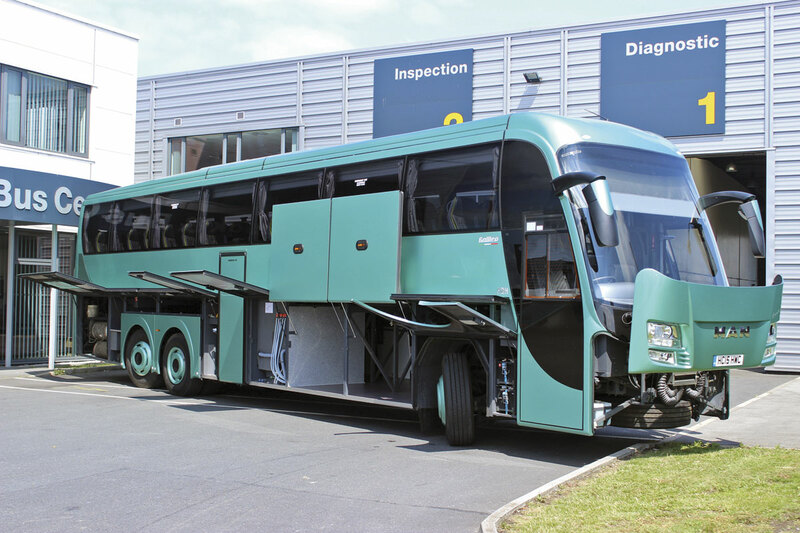 If you want a tri-axle Galileo HDH, BASE have an RR4-26.480 chassis in stock that could go into build in August.